First snow in the valley today. Here comes the mail carrier. He's wearing shorts. Shorts in winter. How Utahn. The snowfall has made me giddy. I love living in a place with seasons, but it really only works when you have a whole year under your belt and experience the transitions. Randin and I arrived in mid-winter, and to be honest I found last year's cold and snow to be overwhelming and depressing. Like being dropped naked into a snowdrift. I felt some dread that this upcoming winter would set me back. Instead I'm thinking of Christmas trees. Yes, this year I think I'll have a small tree and decorate it with the hindu pantheon (that's a lot of ornaments!). I'm starting to move around and exercise with some regularity. I have a physical therapist who, for this month at least, visits me and has given me a list of activities to start building strength. I'm a little embarrassed by this. Me, a yogi, a hatha yoga teacher no less, doesn't know how to build strength on her own? Not from this place. I am graced with compassion thanks to this experience. I have not been the most compassionate yoga teacher. The level of physical strength I assumed in my students was considerable. I've never had a student who couldn't do a lunge for example (or that I didn't assume could do one). Now I am a student who doesn't have the strength to do a lunge. I'm beginning from an unfamiliar place and I don't know the way! I'm grateful for my guide, Adam. I'm a little more than midway through Cycle 9. I will probably begin Cycle 10 November 12th. After that, maintenance for a year. 2009 has been a year of confusion and disorientation! You can tell, just look at my hair! Wet or a Warm Blanket? On Thursday evening I was a wet blanket. I was mad because no one outside of the hospital other than my Sister Kim seemed to remember my big PEG #15 day. I was mad because my big PEG day was marred by faulty port-o-cath. I was mad because I'm not in charge of every little thing at Starfall anymore. I was a wet blanket, embodied, tears and all. Sometime before midnight and dawn on Friday I woke with a moment of clarity. Deep inside I've always known that my port-o-cath was in the wrong place. 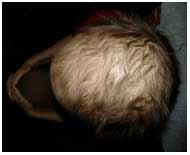 It had been installed during the lowest trough of my treatment, when I was malnourished and depressed. My skin was simply not healthy enough to stretch to accommodate this 1/2" x 1" device. When you know something is wrong, there is just no denying it. I wasn't looking forward to having the device removed and something else installed, but realized I have a year and three months of weekly chemotherapy before me. The device must be as healthy and stable as possible. Essentially, because the skin wasn't healthy enough to stretch part of the suture scarred open, leaving a 1/4" hole. A hole is a very dangerous potential for infection. The latest status? Port-o-cath removed. PICC installed. Here's the lowdown if you want it. PICC will remain in left arm until cycles 9 and 10 are complete, and PEG Asparaginase has completely left my system and I can go off of blood thinners. This is roughly 6 weeks from now. At that time, a new Port-o-cath will be installed, left side, but lower. Now as for Friday, and all the procedures, I have to say it was one of the best, most blissful days of my life. See I asked for warm, not wet blankets. Hospitals are famous for their abundant supply of warm blankets. I had the strangest offer when I arrived at Angiography. The nurse asked if I preferred to be sedated or conscious for the procedures. To be sedated would have added another 2 hours to the event, and I would have missed all the action. I've been sedated once, when the port-o-cath was installed. I liked missing that. I really had to think about this choice, after all it is nice to be oblivious when potentially painful things are happening to your body. But, I really love the team in Angiography, I like to hang out with them, they make me laugh. The surgeon's are skilled, and I like to appreciate their work. I decided to go through it consciously. It's more my style, after all I'm trying to become as conscious as possible, right? What an opportunity to practice. And not in a masochistic way! The numbing is really incredible, no pain, just a little pressure, thankfully, no IV! First they cover me with as many warm blankets as I like, next they tape me under a big blue tent so I can't see what is happening, then they numb me up with lidocaine and the adventure begins. We had a great time while pulling out the port-o-cath. We all shared stories about some of our travels, especially into the wild. One person actually witnessed orcas catching and eating sea lions off of the ice! U2 was requested—one of the nurses had created a play list of the current tour. I asked, "Won't you be bored at the concert having heard all these songs in order already?" He explained, "My wife and I memorize the play list, then sing along with the musicians. It's a spiritual experience." I really got where he was coming from, and my heart filled with the joy of the two of them, sharing their voices with each other, and everyone else there. Suddenly the port was out, whiz, bang, bam, and then it was time for closing the wound. Dr. J had to trim off or shave off the edges of the wound to create a ungranulated surface that would encourage the sides to adhere to each other. As he sewed he told us the story of how play lists on the radio came to be. Apparently, some desperate radio executives were having a power lunch at a local diner with a jukebox. All day long as the executives discussed their predicament, people kept nickeling the same song over and over, right down to the waitress, who selected that song at the end of her shift. "Aha!" said the executives, "People don't want variety and change! They want the same thing again and again." So they (and shortly after every one else) changed their format to 25 songs and that is one of the many reasons the world is stuck in a rut. Once I was sewn, Dr. J looked over his work and said, "I don't mean to brag, but that looks pretty damn good." and then strutted off into the other room to get a mirror for me to appreciate his handiwork. You know, it did look pretty damn good. Two days later, it feels great too! With the port-o-cath removed they shuttled U2 and me, past Randin waiting so patiently, ("Hi honey! One down!" I said), into the room with the X-Ray machine for the PICC line. I won't lie to you. The only thing pleasant about having a PICC (peripherally inserted central catheter) installed is the warm blankets. And, once a PICC is installed it isn't very comfortable. One of the fun things about the X-Ray room however is they often turn on and off the lights so they can see the images. You kind of feel like you are camping with a flashlight. And one time one of the nurses had to crawl under the blue tent to release the tourniquet so it was like camping with another person. By 3PM and after 5 hours of waiting in Room 5 (AKA the Icebox) I was home, filled with Daptomycyn (systemic antibiotic for all my new holes and burns) and Methotrexate. No matter the drama, the perceived obstacle, there is no stopping this protocol when the chemo is due, you get it. Burns: Better everyday, but still, slow healing. Hair: or like the grumpy old man yelling at kids to get out of my yard. PEG: YES finished! 6 weeks from now I'll know what it is to be PEG free. Chemo: No, not chemo free. Methotrexate, 6MP, and Vincristine will accompany me the rest of 2010. As well as Dexamethasone, but at a much lower dose after cycle 10. Dawn and Lisa Marie came over for dinner. I'm not ashamed to admit we were mung bean munchers. The food was great. Lisa Marie and I talked at length about the day's experiences. She introduced me to a concept called contrast. When the distance between two extremes occurs, it creates an opportunity for seeing and experiencing on a much more profound and clear level. As she said this, she opened her hands to represent the distance and immediately I recognized the midline. In my spiritual tradition, it is the space in between the subject and object where the bliss of consciousness resides. I'll tell you, I was in this space all day long. Yes, I was dealing with disappointing, sometimes even painful events but I had accepted their necessity as a blessing. I wound up asking for, and receiving nothing but warm blankets all day. 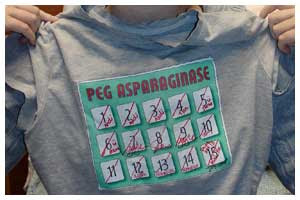 Today I received dose #15 of PEG Asparaginase. That's it. The last one. At last, I've reached a point in my treatment where there isn't a new drug to replace a previous one. Nothing new to come from that venue. About a month from now, I'll know what it feels like not to be on PEG and blood thinners. It seems to be my course though, that a milestone gets met by a setback. My porto-cath has not healed properly, and will be removed tomorrow. I will have PIC installed. It will serve me for a few weeks, then we'll make another plan from there. This will give me some time to heal, without delaying my antibiotics or my chemotherapy. I am tired, I admit, and sad. I wish things were different, but as they are as they are. I am full of love, and gratitude.